Mitsubishi Electric Corporation, Japan is a globally renowned name in the elevator manufacturing industry. Their exceptionally high-quality products and service standards guarantee a vertical transportation solution that will last a lifetime. 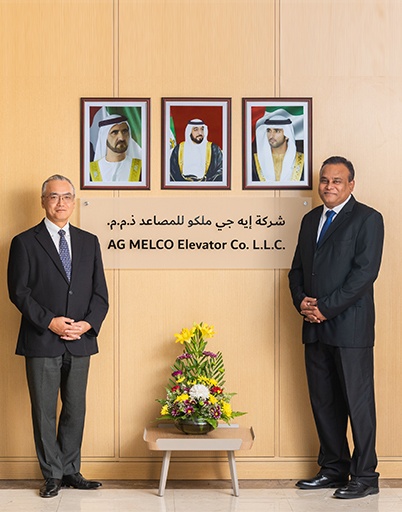 Since 1975, we AG MELCO Elevator Co. L.L.C., through our continued association with Mitsubishi Electric Corporation, Japan offer design, sales, installation, maintenance and modernization solutions for elevators, escalators, moving walks and dumbwaiters. With our Corporate Headquarters in Dubai, UAE and expanding operations in Middle East, Turkey and Central Asia, South Asia and Africa and Oceanic, we have associated ourselves with major landmark projects in all regions. Under the guidance and leadership of Mr. Abdul Mujeeb, CEO and Mr. Hirotsugu Ishiyama, Deputy CEO, we continue to be one of the leaders in the vertical transportation sector in all our operating regions. The phrase, ‘Quality in Motion’, not only defines Mitsubishi Electric but also motivates them to set the world’s highest standards in elevator and escalator innovation, efficiency, safety and comfort. Mitsubishi Electric has been serving the vertical transportation requirements for all industry and regions through their highest quality of manufacturing along with precise installation and Japanese standard of service procedures. Overall statistics portray the least breakdown rate for Mitsubishi installed and serviced units. Aesthetically designed products such as spiral escalators, observation elevators, high-speed MRL elevators etc., fulfill the architectural demands for innovative and varied products in the region. As concern over environmental protection continues to grow around the world, Mitsubishi Electric has considered the environment a companywide priority. Mitsubishi Electric with their advanced technologies takes every action to reduce environmental burden during each process of the elevators and escalators lifecycle and bring energy savings to the products. We take pride in providing excellence to all our clients while ensuring an ultimate level of quality and safety in vertical transport. Being a trendsetter in the industry for 43 years with our world class service performance that match Japanese standards we hold an absolute ‘No Compromise’ policy on Quality and Safety. Contact us to know which of our vertical transportation solution meets your requirement.